A filament that is strong, light and durable and can be used regularly, that is FilRight Maker ABS filament. FilRight Maker ABS filament is of premium quality and suitable for both the novice and the advanced 3D printer user. Why use FilRight Maker ABS filament for 3D prints? ABS (Acrylonitrile Butadiene Styrene) is a particularly strong polymer that is easy to print. This 3D printing material hardly shrinks and can be used for a wide variety of applications due to the high melting temperature. For which 3D printers is FilRight Maker ABS filament suitable? Due to the very small diameter tolerance, this filament is suitable for almost all (FDM) 3D printers. FilRight Maker ABS filament is available in different colors and in both 1.75 and 2.85 mm diameters. Other colors and spool sizes for 3D prints are available on request. FilRight Maker ABS filament is best printed at high temperature, preferably between 235°C and 260°C. The use of a heatbed is required. The recommended temperature of the heatbed is between 90°C and 110°C. We recommend using an adhesive for 3D printing with ABS filament, like PrintaFix, for the print bed. Need more technical specifications regarding ABS filament? Contact us for technical data. FilRight Maker ABS filament is supplied on a 1000 gram spool. Due to the transparency of the spool, you can always see how much filament is left. This way you will never unexpectedly be short on ABS filament. 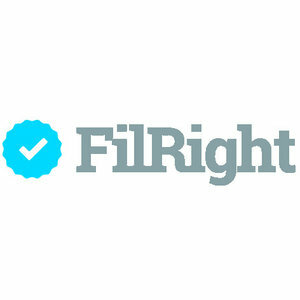 All FilRight filaments for 3D printers are completely sealed and packed in a specially designed cardboard box, so that no damage can occur during transport.